Phenylketonuria (PKU) can be defined as a rare metabolic disorder caused by a deficiency in the production of the hepatic (liver) enzyme phenylalanine hydroxylase (PAH). PKU is the most serious form of a class of diseases referred to as "hyperphenylalaninemia," all of which involve above normal (elevated) levels of phenylalanine in the blood. The primary symptom of untreated PKU, mental retardation, is the result of consuming foods that contain the amino acid phenylalanine, which is toxic to brain tissue. PKU is an inherited, autosomal recessive disorder. It is the most common genetic disease involving "amino acid metabolism." PKU is incurable, but early, effective treatment can prevent the development of serious mental incapacity. PKU is a disease caused by the liver's inability to produce a particular type of PAH enzyme. This enzyme converts (metabolizes) the amino acid called phenylalanine into another amino acid, tyrosine. This is the only role of PAH in the body. A lack of PAH results in the buildup of abnormally high phenylalanine concentrations (or levels) in the blood and brain. Above normal levels of phenylalanine are toxic to the cells that make up the nervous system and causes irreversible abnormalities in brain structure and function in PKU patients. Phenylalanine is a type of teratogen. Teratogens are any substance or organism that can cause birth defects in a developing fetus. The liver is the body's chief protein processing center. Proteins are one of the major food nutrients. They are generally very large molecules composed of strings of smaller building blocks or molecules called amino acids. About twenty amino acids exist in nature. The body breaks down proteins from food into individual amino acids and then reassembles them into "human" proteins. Proteins are needed for growth and repair of cells and tissues, and are the key components of enzymes, antibodies, and other essential substances. The extensive network of nerves in the brain and the rest of the nervous system are made up of nerve cells. Nerve cells have specialized extensions called dendrites and axons. Stimulating a nerve cell triggers nerve impulses, or signals, that speed down the axon. These nerve impulses then stimulate the end of an axon to release chemicals called "neurotransmitters" that spread out and communicate with the dendrites of neighboring nerve cells. Many nerve cells have long, wire-like axons that are covered by an insulating layer called the myelin sheath. This covering helps speed nerve impulses along the axon. In untreated PKU patients, abnormally high phenylalanine levels in the blood and brain can produce nerve cells with "deformed" axons and dendrites, and cause imperfections in the myelin sheath referred to as hypomyelination and demylenation. This loss of myelin can "short circuit" nerve impulses (messages) and interrupt cell communication. A number of brain scan studies also indicate a degeneration of the "white matter" in the brains of older patients who have not maintained adequate dietary control. PKU can also affect the production of one of the major neurotransmitters in the brain, called dopamine. The brain makes dopamine from the amino acid tyrosine. PKU patients who do not consume enough tyrosine in their diet cannot produce sufficient amounts of dopamine. Low dopamine levels in the brain disrupt normal communication between nerve cells, which results in impaired cognitive (mental) function. Some preliminary research suggests that nerve cells of PKU patients also have difficulty absorbing tyrosine. This abnormality may explain why many PKU patients who receive sufficient dietary tyrosine still experience some form of learning disability. IQ (intelligence quotient) tests provide a measure of cognitive function. The IQ of PKU patients is generally lower than the IQ of their healthy peers. Students with PKU often find academic tasks difficult and must struggle harder to succeed than their non-PKU peers. They may require special tutoring and need to repeat some of their courses. Even patients undergoing treatment programs may experience problems with typical academic tasks as math, reading, and spelling. Visual perception, visual-motor skills, and critical thinking skills can also be affected. Ten years of age seems to be an important milestone for PKU patients. After age 10, variations in a patient's diet seems to have less influence on their IQ development. People with PKU tend to avoid contact with others, appear anxious and show signs of depression. However, some patients may be much more expressive and tend to have hyperactive, talkative, and impulsive personalities. It is also interesting to note that people with PKU are less likely to display such "antisocial" habits as lying, teasing, and active disobedience. It should be emphasized that current research findings are still quite preliminary and more extensive research is needed to clearly show how abnormal phenylalanine levels in the blood and brain might affect behavior and academic performance. One in fifty individuals in the United States have inherited a gene for PKU. About five million Americans are PKU carriers. About one in 15,000 babies test positive for PKU in the United States. Studies indicate that the incidence of this disease in Caucasian and Native American populations is higher than in African-American, Hispanic, and Asian populations. PKU symptoms are caused by alterations or "mutations" in the genetic code for the PAH enzyme. Mutations in the PAH gene prevent the liver from producing adequate levels of the PAH enzyme needed to break down phenylalanine. The PAH gene and its PKU mutations are found on chromosome 12 in the human genome. In more detail, PKU mutations can involve many different types of changes, such as deletions and insertions, in the DNA of the gene that codes for the PAH enzyme. A person with one normal and one PKU gene is called a carrier. A carrier does not display any symptoms of the disease because their liver produces normal quantities of the PAH enzyme. However, PKU carriers can pass the PKU genetic mutation onto their children. Two carrier parents have a 25% chance of producing a baby with PKU symptoms, and a 50% chance having a baby that is a carrier for the disease. Although PKU conforms to these basic genetic patterns of inheritance, the actual expression, or phenotype, of the disease is not strictly an "either/or" situation. This is because there are at least 400 different types of PKU mutations. Although some PKU mutations cause rather mild forms of the disease, others can initiate much more severe symptoms in untreated individuals. The more severe the PKU mutation, the greater the effect on cognitive development and performance (mental ability). Untreated PKU patients develop a broad range of symptoms related to severely impaired cognitive function, sometimes referred to as mental retardation. Other symptoms can include extreme patterns of behavior, delayed speech development, seizures, a characteristic body odor, and light body pigmentation. The light pigmentation is due to a lack of melanin, which normally colors the hair, skin and eyes. 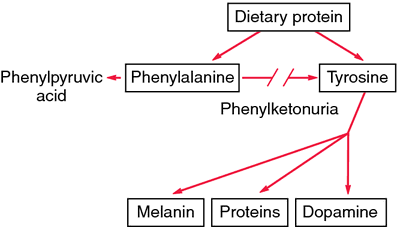 Melanin is made from the amino acid tyrosine, which is lacking in untreated cases of PKU. Physiologically, PKU patients show high levels of phenylalanine and low levels of tyrosine in the blood. Babies do not show any visible symptoms of the disease for the first few months of life. However, typical PKU symptoms usually do show up by a baby's first birthday. The American Academy of Pediatrics recommends that this test should be performed on infants between 24 hours and seven days after birth. The preferred time for testing is after the baby's first feeding. If the initial PKU test produces a positive result, then follow-up tests are performed to confirm the diagnosis and to determine if the elevated phenylalanine levels may be caused by some medical condition other than PKU. Treatment for PKU is recommended for babies that show a blood phenylalanine level of 7-10 mg/dL or higher for more than a few consecutive days. Another, more accurate test procedure for PKU measures the ratio (comparison) of the amount of phenylalanine to the amount of tyrosine in the blood. Newer diagnostic procedures (called mutation analysis and genotype determination) can actually identify the specific types of PAH gene mutations inherited by PKU infants. Large-scale studies have helped to clarify how various mutations affect the ability of patients to process phenylalanine. This information can help doctors develop more effective customized treatment plans for each of their PKU patients. The severity of the PKU symptoms experienced by people with this disease is determined by both lifestyle as well as genetic factors. In the early 1950s, researchers first demonstrated that phenylalanine restricted diets could eliminate most of the typical PKU symptoms—except for mental retardation. Today, dietary therapy (also called nutrition therapy) is the most common form of treatment for PKU patients. PKU patients who receive early and consistent dietary therapy can develop fairly normal mental capacity to within about five IQ points of their healthy peers. By comparison, untreated PKU patients generally have IQ scores below 50. Phenylalanine is actually an essential amino acid. This means that it has to be obtained from food because the body cannot produce this substance on its own. Typical diets prescribed for PKU patients provide very small amounts of phenylalanine and higher quantities of other amino acids, including tyrosine. The amount of allowable phenylalanine can be increased slightly as a child becomes older. In addition, PKU diets include all the nutrients normally required for good health and normal growth, such as carbohydrates, fats, vitamins, and minerals. High protein foods like meat, fish, chicken, eggs, nuts, beans, milk, and other dairy products are banned from PKU diets. Small amounts of moderate protein foods (such as grains and potatoes) and low protein foods (some fruits and vegetables, low protein breads and pastas) are allowed. Sugar-free foods, such as diet soda, which contain the artificial sweetener aspartame, are also prohibited foods for PKU patients. That is because aspartame contains the amino acid phenylalanine. Ideally, school-age children with PKU should be taught to assume responsibility for managing their diet, recording food intake, and for performing simple blood tests to monitor their phenylalanine levels. Blood tests should be done in the early morning when phenylalanine levels are highest. Infants and young children require more frequent blood tests than older children and adults. The amount of natural foods allowed in a diet could be adjusted to ensure that the level of phenylalanine in the blood is kept within a safe range—two to 6 mg/dL before 12 years of age and 2-15 mg/dL for PKU patients over 12 years old. A specialized PKU diet can cause abnormal fluctuations in tyrosine levels throughout the day. Thus, some health professionals recommend adding time released tyrosine that can provide a more constant supply of this amino acid to the body. It should be noted that some PKU patients show signs of learning disabilities even with a special diet containing extra tyrosine. Research studies suggests that these PKU patients may not be able to process tyrosine normally. In general, medical researchers express concern about the great variation in treatment programs currently available to PKU patients around the world. They have highlighted the urgent need for new, consistent international standards for proper management of PKU patients, which should emphasize comprehensive psychological as well as physiological monitoring and assessment. Women with PKU must be especially careful with their diets if they want to have children. They should ensure that phenylalanine blood levels are under control before conception and throughout her pregnancy. Mothers with elevated (higher than normal) phenylalanine levels are high risk for having babies with significant birth defects, such as microencephaly (smaller than normal head size), and congenital heart disease (abnormal heart structure and function), stunted growth, mental retardation, and psychomotor (coordination) difficulties. This condition is referred to as maternal PKU and can even affect babies who do not have the PKU disease. Early newborn screening, careful monitoring, and a life-long strict dietary management can help PKU patients to live normal, healthy, and long lives. Brust, John C. M. The Practice Of Neural Science: From Synapses To Symptoms. New York: McGraw-Hill, 2000. Gilroy, John. Basic Neurology. 3rd ed. New York: McGraw-Hill, 2000. Ratey, John J. A User's Guide To The Brain: Perception, Attention, And The Four Theaters Of The Brain. 1st ed. New York: Pantheon Books, 2001. Weiner, William J., and Christopher G. Goetz, editors. Neurology For The Non-Neurologist. 4th ed. Philadelphia: Lippincott, Williams & Wilkins, 1999. Burgard, P. "Development of intelligence in early treated phenylketonuria." European Journal of Pediatrics 159, Supplement 2 (October 2000): S74-9. Chang, Pi-Nian, Robert M. Gray, and Lisa Lehn O'Brien. "Review: Patterns of academic achievement among patients treated early with phenylketonuria." European Journal of Pediatrics 159, no.14 (2000): S96-9. Eastman, J.W., J.E. Sherwin, R. Wong, C.L. Liao, R.J. Currier, F. Lorey, and G. Cunningham. "Use of the phenylalanine:tyrosine ratio to test newborns for phenylketonuria in a large public health screening programme." Journal of Medical Screening 7, no. 3 (2000): 131-5. MacDonald, A. "Diet and compliance in phenylketonuria." European Journal of Pediatrics 159, Supplement 2 (October 2000): S136-41. Smith, Isabel, and Julie Knowles. "Behaviour in early treated phenylketonuria: a systematic review." European Journal of Pediatrics 159, no. 14 (2000): S89-93. Stemerdink, B.A., A.F. Kalverboer, J.J. van der Meere, M.W. van der Molen, J. Huisman, L.W. de Jong, F.M. Slijper, P.H. Verkerk, and F.J. van Spronsen. "Behaviour and school achievement in patients with early and continuously treated phenylketonuria." Journal of Inherited Metabolic Disorders 23, no. 6 (2000): 548-62.
van Spronsen, F.J.F., M.M. van Rijn, J. Bekhof, R. Koch, and P.G. Smit. "Phenylketonuria: tyrosine supplementation in phenylalanine-restricted diets." American Journal of Clinical Nutrition 73, no. 2 (2001): 153-7. Wappner, Rebecca, Sechin Cho, Richard A. Kronmal, Virginia Schuett, and Margretta Reed Seashore. "Management of Phenylketonuria for Optimal Outcome: A Review of Guidelines for Phenylketonuria Management and a Report of Surveys of Parents, Patients, and Clinic Directors." Pediatrics 104, no. 6 (December 1999): e68. American Academy of Allergy, Asthma & Immunology. 611 E. Wells St, Milwaukee, WI 53202. (414) 272-6071. Fax: (414) 272-6070. http://www.aaaai.org/default.stm. Children's PKU Network. 1520 State St., Suite 111, San Diego, CA 92101-2930. (619) 233-3202. Fax: (619) 233 0838. pkunetwork@aol.com. March of Dimes Birth Defects Foundation. 1275 Mamaroneck Ave., White Plains, NY 10605. (888) 663-4637. resourcecenter@modimes. http://www.modimes.org. National PKU News. Virginia Schuett, editor/dietician. 6869 Woodlawn Avenue NE #116, Seattle, WA 98115-5469. (206) 525-8140. Fax: (206) 525-5023. http://www.pkunews.org. University of Washington PKU Clinic. CHDD, Box 357920, University of Washington, Seattle, WA. (206) 685-3015. Within Washington State: (877) 685-3015. Clinic Coordinator: vam@u.washington.edu. http://depts.washington.edu/pku/contact.html. Amino acid — Organic compounds that form the building blocks of protein. There are 20 types of amino acids (eight are "essential amino acids" which the body cannot make and must therefore be obtained from food). Axon — Skinny, wire-like extension of nerve cells. Genetic disease — A disease that is (partly or completely) the result of the abnormal function or expression of a gene; a disease caused by the inheritance and expression of a genetic mutation. IQ — Abbreviation for Intelligence Quotient. Compares an individual's mental age to his/her true or chronological age and multiplies that ratio by 100. Metabolism — The total combination of all of the chemical processes that occur within cells and tissues of a living body. Myelin — A fatty sheath surrounding nerves in the peripheral nervous system, which help them conduct impulses more quickly. Nervous system — The complete network of nerves, sense organs, and brain in the body. Phenylalanine — An essential amino acid that must be obtained from food since the human body cannot manufacture it. Protein — Important building blocks of the body, composed of amino acids, involved in the formation of body structures and controlling the basic functions of the human body. Recessive — Genetic trait expressed only when present on both members of a pair of chromosomes, one inherited from each parent. Allergy and Asthma Network. Mothers of Asthmatics, Inc. 2751 Prosperity Ave., Suite 150, Fairfax, VA 22031. (800) 878-4403. Fax: (703)573-7794. Consensus Development Conference on Phenylketonuria (PKU): Screening and Management, October 16-18, 2000. 〈http://odp.od.nih.gov/consensus/news/upcoming/pku/pku_info.htm#overview〉. Genetics and Public Health in the 21st Century. Using Genetic Information to Improve Health and Prevent Disease. http://www.cdc.gov/genetics/_archive/publications/Table. a congenital disease due to a defect in metabolism of the amino acid phenylalanine. The condition is hereditary and transmitted as a recessive trait. Symptoms result from lack of an enzyme, phenylalanine hydroxylase, necessary for the conversion of phenylalanine to tyrosine. Phenylalanine collects in the blood and there is eventual excretion of phenylpyruvic acid in the urine If untreated, the condition results in mental retardation and other abnormalities. adj., adj phenylketonu´ric. Persons with phenylketonuria are usually blue-eyed and blond with defective pigmentation; the skin is excessively sensitive to light and susceptible to eczema. Other manifestations include tremors, poor muscular coordination, and excessive perspiration. A characteristic “mousy odor” may be present due to phenylacetic acid in the breath, skin, and urine. Convulsions may also be associated with the disease. Diagnosis. Screening of newborns for PKU entails a simple heel-stick blood sampling test called the guthrie test, which is routinely performed in the United States, Canada, and many other countries. The test should be done within two weeks of birth, preferably soon after the infant has been fed. Variants of PKU have been named hyperphenylalaninemia without phenylketonuria and atypical phenylketonuria. Criteria for establishment of a diagnosis of classic PKU vary from state to state and country to country. The most common blood phenylalanine recommendations in U.S. laboratories are 2 to 6 mg/dL for individuals under age 12 and 2 to 10 mg/dL for those aged 12 and up. Diagnosis of variants of the disease depends in part on values of plasma phenylalanine, family history, clinical course, and the infant's response to ingestion of natural protein. Treatment. Restriction of the infant's diet to control the effects of PKU is prescribed on the basis of his or her requirements for phenylalanine, protein, and calories. Effectiveness of the special diet must be evaluated by frequent determinations of phenylalanine blood levels; otherwise the child may suffer from serious dietary deficiencies. The development of palatable hydrolysate preparations such as Lofenalac has made treatment easier. About 90 per cent of the protein requirement is derived from this dietary protein substitute. The National Institutes of Health Consensus Development Conference in October, 2000 identified the need for more research on PKU to develop better treatments than the dietary restrictions that are now the mainstay of therapy. Among other recommendations were the development of standard screening procedures, equal access to culturally sensitive, age-appropriate treatment programs, and appropriate family education. Infants with blood phenylalanine levels greater than 10 mg/dL should be started on treatment as soon as possible, no later than 7 to 10 days after birth. Frequent monitoring of blood levels is required. It was also recommended that those affected stay on the restricted diet for life. Treatment should be multidisciplinary and lifelong. The full NIH Consensus Statement on Phenylketonuria (PKU): Screening and Management is available by calling 1-888-NIH-CONSENSUS (1-888-644-2667) or accessing the NIH Consensus Development Program web site at http://consensus.nih.gov. Phenylketonuria. Lack of phenylalanine hydroxylase blocks the transformation of phenylalanine into tyrosine. Unmetabolized phenylalanine is shunted into the pathway that leads to the formation of phenylketones. Excess phenylalanine also inhibits formation of melanin from tyrosine. From Damjanov, 2000. Autosomal recessively inherited inborn error of metabolism of phenylalanine characterized by deficiency of phenylalanine hydroxylase [MIM*261600] caused by mutation in the phenylalanine hydroxylase gene (PAH) on 12q; occasionally, dihydropteridine reductase [MIM*261630], caused by mutation in the dihydropteridine reductase gene (DHPR) on 4p; rarely, dihydrobiopterin synthetase [MIM*261640], caused by mutation in the pyruvoyl tetrahydropterin synthase gene (PTS) on 11q; or even more rarely, deficiency of guanidine triphosphate cyclohydrolase 1 [MIM*233910]. The disorder is characterized by inadequate formation of l-tyrosine, elevation of serum l-phenylalanine, urinary excretion of phenylpyruvic acid and other derivatives, and accumulation of phenylalanine and its metabolites, which can produce brain damage resulting in severe mental retardation, often with seizures, other neurologic abnormalities such as retarded myelination and deficient melanin formation leading to hypopigmentation of the skin and eczema. Compare: hyperphenylalaninemia. A genetic disorder in which the body lacks the enzyme necessary to metabolize phenylalanine to tyrosine. Left untreated, the disorder can cause brain damage and progressive intellectual disability as a result of the accumulation of phenylalanine and its breakdown products. abnormal presence of phenylketone and other metabolites of phenylalanine in the urine, characteristic of an inborn metabolic disorder caused by the absence or a deficiency of phenylalanine hydroxylase, the enzyme responsible for the conversion of the amino acid phenylalanine into tyrosine. Accumulation of phenylalanine is toxic to brain tissue. Untreated individuals have very fair hair, eczema, a mousy odor of the urine and skin, and progressive mental retardation. Treatment consists of a diet low in phenylalanine. Phenylketonuria occurs approximately once in 16,000 births in the United States. Most states require a screening test for all newborns. See also Guthrie's bacterial inhibition assay. phenylketonuric, adj. Congenital deficiency of phenylalanine 4-monooxygenase or occasionally of dihydropherine reductase or of dihydrobiopterin synthetase; it causes inadequate formation of l-tyrosine, elevation of serum l-phenylalanine, urinary excretion of phenylpyruvic acid and other derivatives, and accumulation of phenylalanine and its metabolites, which can produce brain damage resulting in severe mental retardation, often with seizures, other neurologic abnormalities such as retarded myelination, and deficient melanin formation leading to hypopigmentation of the skin and eczema. An AUTOSOMAL RECESSIVE inherited deficiency of the liver enzyme phenylalanine hydroxylase that converts the amino acid phenylalanine into tyrosine. Phenylalanine and its toxic derivatives accumulate in the body and can cause brain damage with mental retardation, unexpectedly fair hair, blue eyes and a musty body odour. The disease is caused by some of more than 500 mutations of the gene that codes for phenylalanine hydroxylase. A co-factor, tetrahydrobiopterin is also involved in the conversion and it has been discovered that in mild cases of phenylketonuria this substance can significantly lower the blood levels of phenylalanine. Babies are screened at birth by the Guthrie test and about 1 in 10,000 is found to have the condition. A diet free from phenylalanine can prevent harm from developing, so breast feeding must be avoided and special diets provided. an INBORN ERROR OF METABOLISM in humans in which there is the inability to convert PHENYLALANINE to tyrosine, due to the absence of a functional phenylalanine hydroxylase enzyme. The condition is controlled by the recessive allele of an autosomal gene, probably on chromosome 1; thus affected individuals are recessive homozygotes having received one recessive allele from each parent, both of whom are usually heterozygous ‘carriers’. The effects of PKU are many and extremely serious. Perhaps the principal problem is an abnormal accumulation of phenylalanine in the blood and other tissues which adversely affects the nervous tissue to such an extent that 90% of affected individuals have an IQ of less than 40 and thus are severely mentally retarded. There is microcephaly (reduced brain size) in two thirds of all PKU cases and 75% show ‘tailor's posture’, in which muscular hypertonicity causes contraction of the leg and arm muscles so that individuals sit cross-legged with their arms drawn into the body. The condition can be treated if discovered in very early childhood. Treatment consists of a diet low in phenylalanine (some of this amino acid must be present in the diet since it is an ESSENTIAL AMINO ACID). In the UK, a small blood sample is taken from every newborn baby and the sample undergoes a Guthrie test in which high levels of phenylalanine in the blood are detected by inhibition of bacterial growth. Ivar Asbjorn, Norwegian physician, 1888-1973. Inborn error of metabolism of phenylalanine characterized by deficiency of phenylalanine hydroxylase. n a condition in which metabolism is severely compromised because of the absence of a phenylaline-processing enzyme resulting in mental retardation, although a prescribed diet can minimize its severity. Q. I heard that there may be a relationship between autism and PKU I heard that there may be a relationship between autism and PKU, but is there an increased risk of autism from childhood immunizations for children who have PKU? A. PKU and Autism- from what I've heard, PKU can lead to Autism if not treated. but about the vaccination and the autism- there is no connection what so ever. there were dozens of extensive research that showed no connection. at all. Family conditions and dietary control in phenylketonuria. A single polymorphic STR system in the human phenylalanine hydroxylase gene permits rapid prenatal diagnosis and carrier screening for phenylketonuria. Access to Phenylketonuria treatment by judicial means in Rio Grande do Sul, Brazil: characterization of the sample (n = 19 lawsuits). Phenylketonuria is still a major cause of mental retardation in Tunisia despite the possibility of treatment. Effect of dietary measures on body weight and height of children with phenylketonuria in East Germany. Questions asked on significance of minor pathways in phenylketonuria were least in number. The disorders being screened include thalassemia, sickle cell anemia, homocystinuria, phenylketonuria, glutaric aciduria and methylmalonic aciduria. The history of newborn screening dates back to 1959 when Dr Robert Guthrie developed a test to detect high phenylalanine levels by microbiological bacterial inhibition test on the dry blood spot (DBS) sample collected on a filter paper (Guthrie card) to diagnose phenylketonuria in the newborn babies. Approved products include Naglazyme (galsulfase) for mucopolysaccharidosis VI, Kuvan (sapropterin dihydrochloride) for phenylketonuria, Aldurazyme (laronidase) for mucopolysaccharidosis I and Firdapse (amifampridine phosphate) for the treatment of Lambert Eaton Myasthenic Syndrome. Summary: RIYADH: One out of 13,000 newborns in the Kingdom are afflicted with Phenylketonuria (PKU), a scientific workshop in Riyadh was told on Wednesday. The newborn screening programme was started in 1995 with screening for phenylketonuria (PKU).